CAS/CL Cell Analysis System | HAI Labs, Inc. Built on the original corner-method for cell counting, the CAS/CL Cell Analysis System not only does the math, but also shows you all its work. It’s accuracy you can verify and rely on. 1. Each cell is analyzed individually. Its number of sides, area, and perimeter are displayed in the cell table. 2. Mean and standard deviation are calculated for the selected sample. 3. 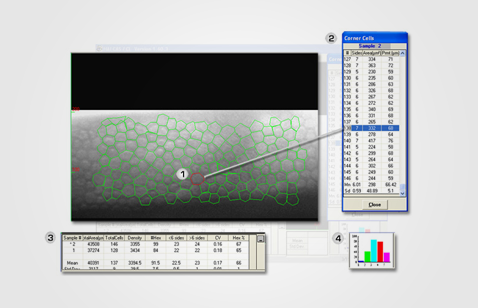 Total area, number of cells, cell density, hex %, and coefficient of variation mean are calculated and displayed in the analysis window. Mean and standard deviation are also calculated for multiple samples. 4. Histogram is generated and displayed automatically. 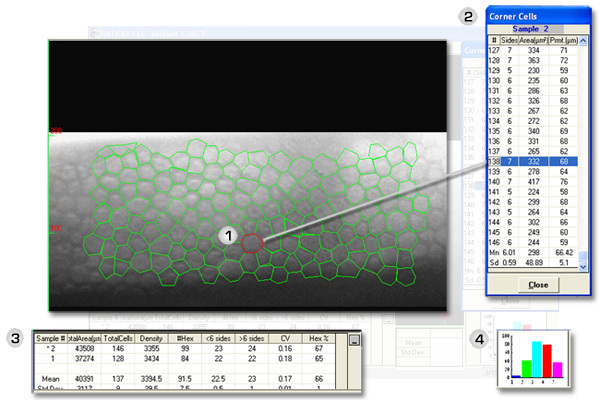 From start to finish, you can analyze 100 cells in just 3 – 5 minutes. HAI CAS / CL Version is a clinical automatic cell count and analysis system with image enhancement and database functions. It is compatible with all existing specular microscopes, both contact and non-contact models, and handles small- to large-scale clinical studies, from pharmaceutical to instrumental. With HAI CAS / CL Version, you can create and manage multiple databases. For example, in a clinical setting, each doctor can create and maintain his/her own database. For clinical studies, separate databases may be used for each study group. Finally, unlimited calibration groups can be set up for a variety of studies.